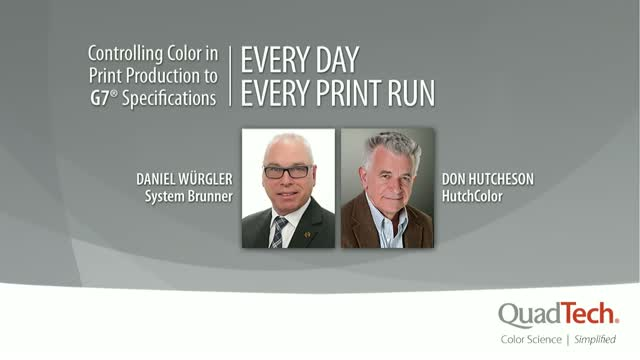 Many print operations already understand the benefits of color management using gray balance as a control factor. And calibrating your press to meet the Idealliance G7 specification is becoming a major selling point to earn print buyer confidence. When calibration is done as a one-time event, most offset press control systems still rely on traditional solid ink density control in print production, with no way of automatically controlling and monitoring G7 metrics, avoiding critical color variations. The piece that has been missing—until now—is the ability to use inline color control to continuously monitor and keep every print job within G7 specifications. Rather than thinking of G7 as a one-time calibration event, QuadTech and System Brunner are introducing a complete system for ensuring G7 quality for every print run. Join us for an informative webinar explaining G7 as a calibration methodology and for press control, INSTRUMENT FLIGHT® with gray balance control (the world’s first G7 certified press control system), and the newest software enhancement for controlling print production to G7 metrics. QuadTech (www.quadtechworld.com) is the leading innovator of advanced color and inspection technology for the printing industry. Our modular and flexible solutions achieve complete control over every phase of production—delivering consistent, repeatable, and provable print quality. We simplify print performance through automated workflow solutions for packaging, newspaper, and commercial print operations. QuadTech color management, register control, and defect management systems are sold in over 100 countries around the world. Headquartered in Sussex, Wisconsin, USA, QuadTech maintains a worldwide network of sales and service operations.